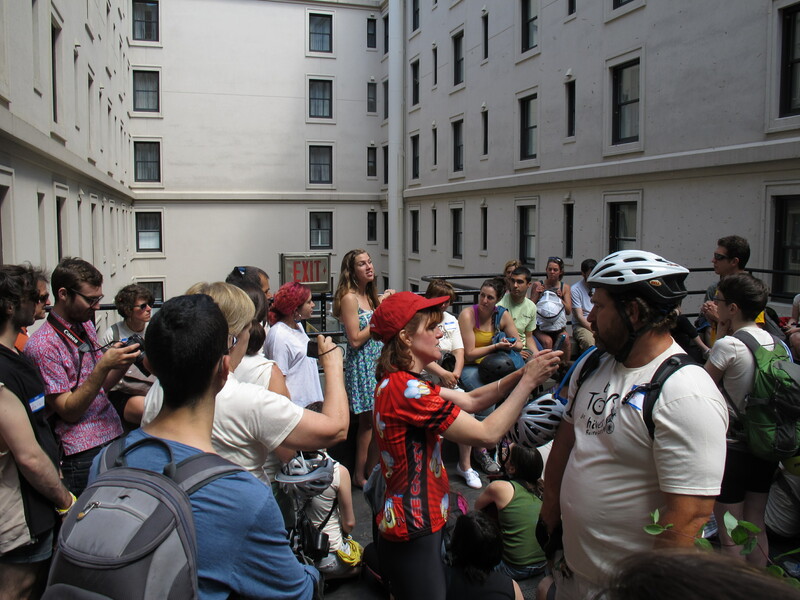 The Tour de Hives will engage, educate and enchant you with a first-hand look at honeybees in hives across the city, guided by the humans who tend them. 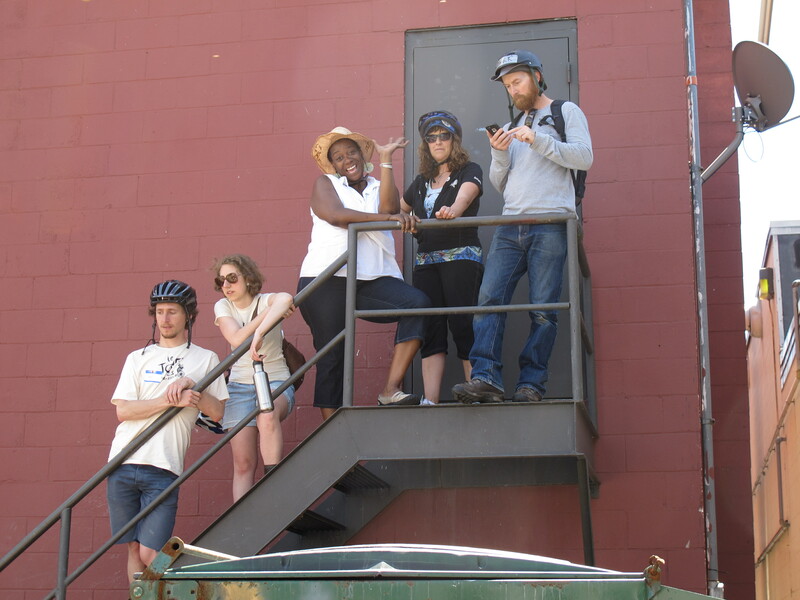 On Sunday, June 7th, join us for a bicycle tour of apiaries in Jamaica Plain, Mattapan, and Chestnut Hill, followed by a festival and picnic lunch at the beautiful Loring-Greenough House in Jamaica Plain. Come celebrate the bees with us! General Admission has SOLD OUT but there are still a limited number of tickets available for our family-oriented tour group (which includes seeing live bees and making candles, among other activities). The lunch/festival portion of our day is also free and open to the public, so swing by the Loring Greenough House in JP anytime between noon and 3pm to check out our vendors, taste a variety of local honey as well as honey from around the world, grab a vegan taco from the Taco Party food truck and listen to some live folk tunes! 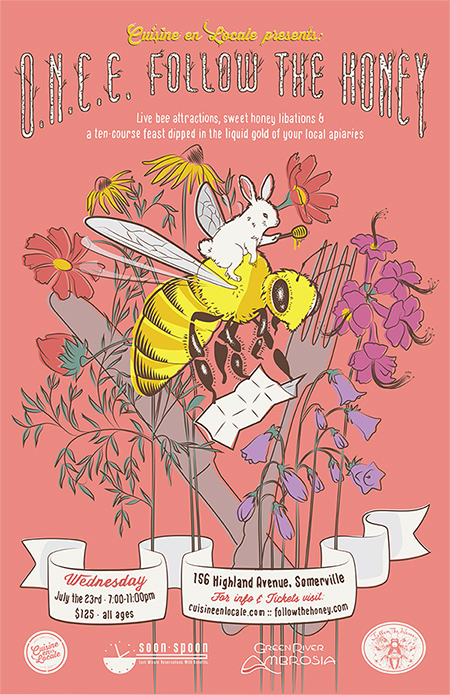 Cuisine en Locale teams up with Harvard Square’s Follow The Honey, Inc.and Soon Spoon on Wednesday, July 23 to produce a 10-course culinary journey through 10+ Massachusetts apiaries, including Herban Honey from Sadie’s Leland hives! Commune with local bees and their stewards in peak summer with local honey harvests for 10 nectar-ific courses, with bee education and bee entertainment throughout the evening, including a “bee bearding” by performance artist Sarah Paterson and Carlisle Honey beekeeper Rick Reault; a mellifluous performance from honey-tongued Cambridge Poet Populist Emeritas, Toni Bee, and a Best Bees live hive observation, among other buzzworthy surprises. Oh, and dress to impress: best “Yellow Is The New Black” costume wins a private after-hours tasting for 6 at Follow The Honey. Stay tuned for the honey-inspired drink menu. 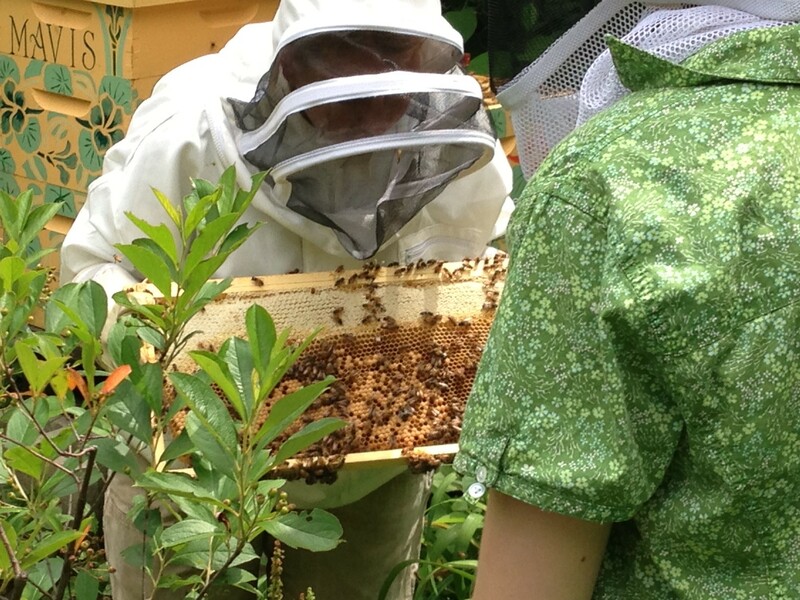 Have you ever considered becoming a social insect steward or a honey matron? 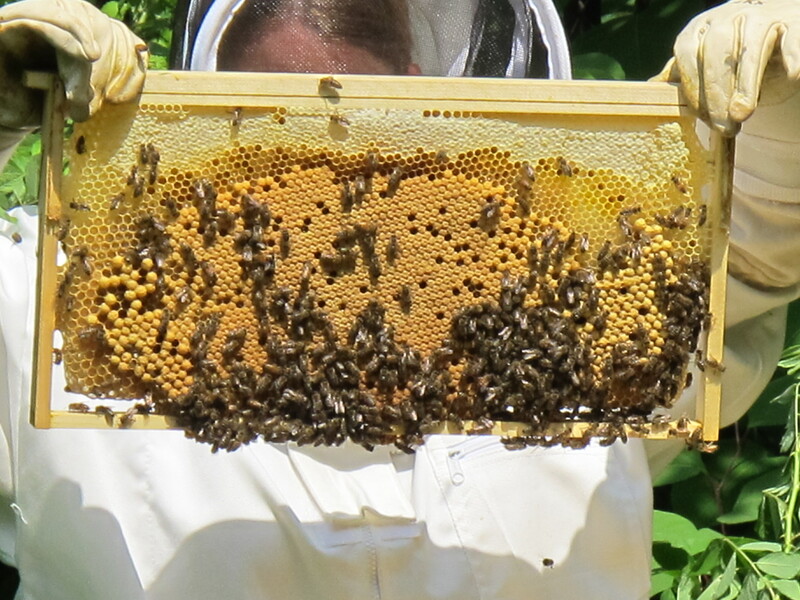 Join us for a 6-week, hands-on course for anyone interested in bees and beginning beekeeping! You will learn. . .
★ The basic techniques of organic beekeeping, including materials and equipment, beehive structure, the life cycle of bees, hive development and dynamics, seasonal apiary work, honey and hive products, common pests and diseases, and organic hive management. 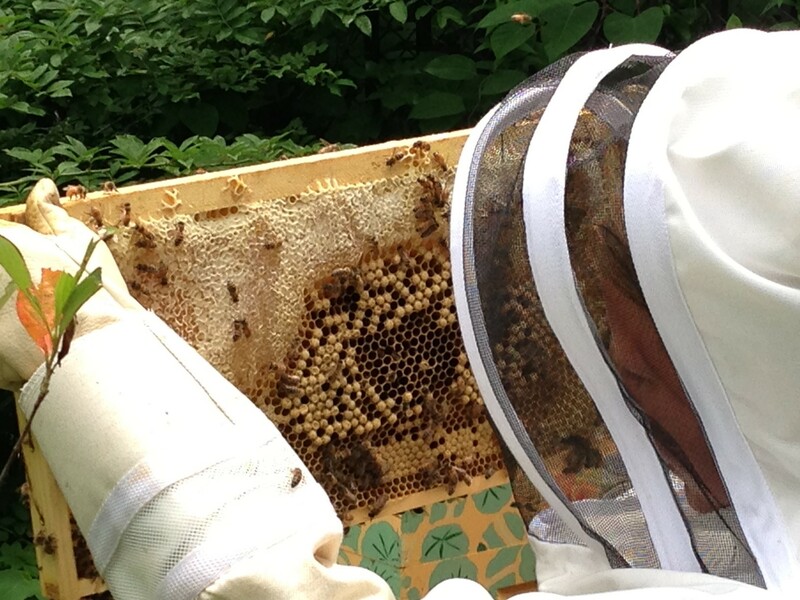 ★ We will taste local and varietal honeys, and learn about harvesting and using bee products. ★ You will learn everything you need to know to set up your own backyard apiary! WHEN: Six consecutive Thursday evenings, January 23rd – February 27th, 7:00pm – 8:30pm. There will also be a hands-on field date in April, date TBD. Course fee includes a hands-on field day in April, date TBD. 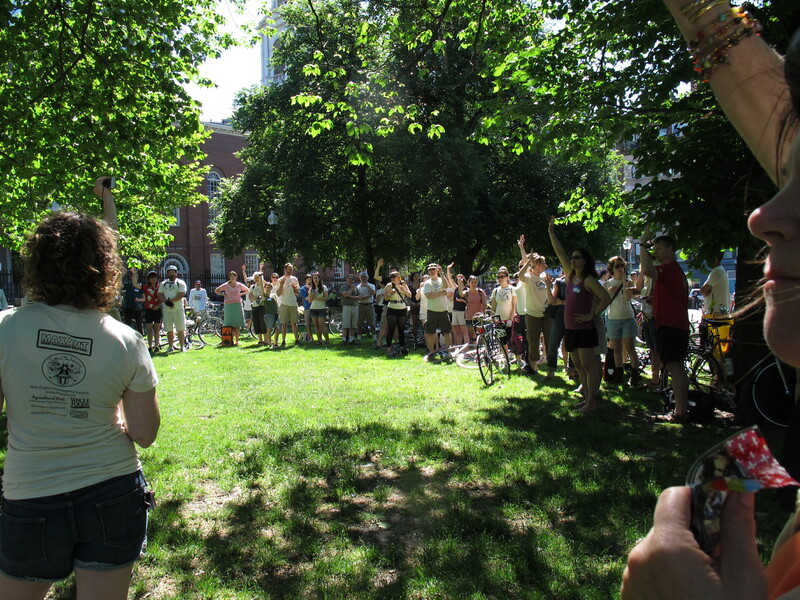 Course instructors: Stephanie Elson and Sadie Richards are co-founders of the Boston Beekeepers Club, and organizers of the Tour de Hives (an annual bike tour of Boston’s urban apiaries). Stephanie has been keeping bees for 5 years in her backyard. She runs The Benevolent Bee, a local business selling honey, candles, and other handcrafted bee products. Sadie is a 4th year beekeeper. 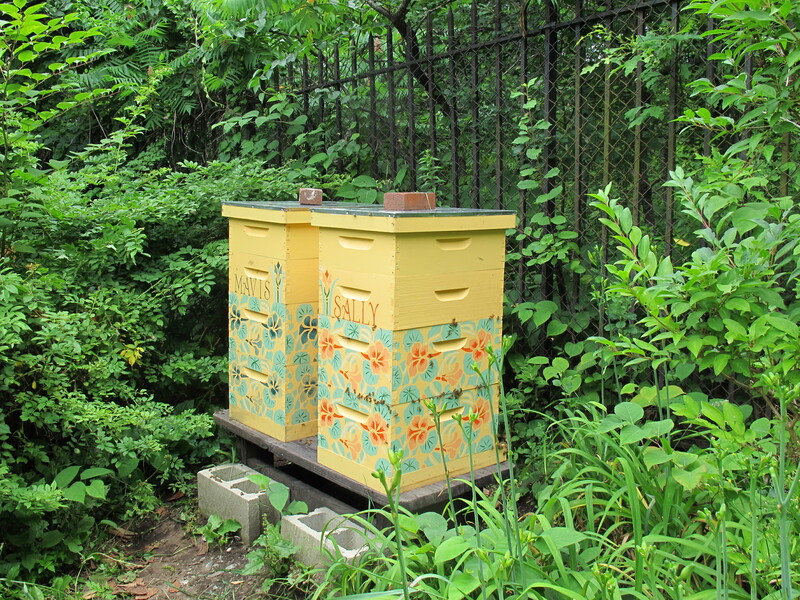 She keeps her bees at the Leland Street Community Garden, and at the Boston Nature Center. Guest lecturers will also visit the class on occasion. 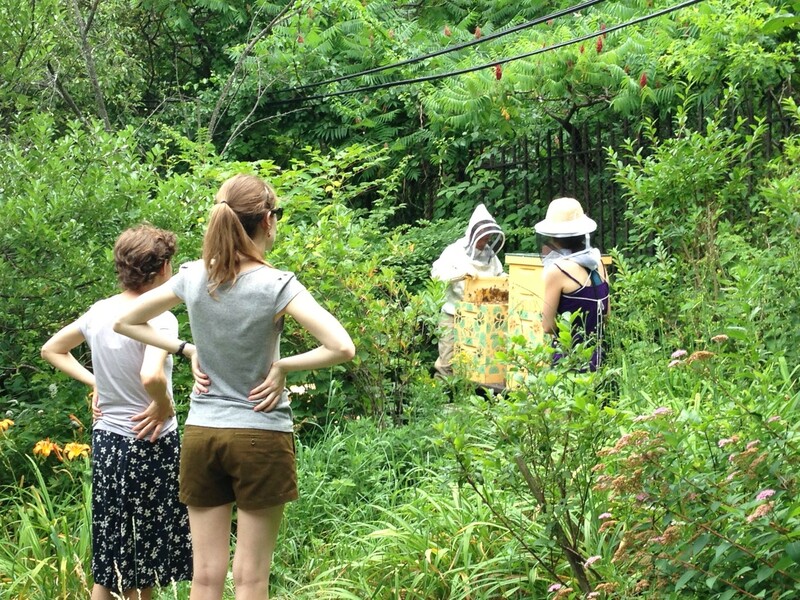 Both Stephanie and Sadie trained in beekeeping under local organic beekeeper, Jean-Claude Bourrut. 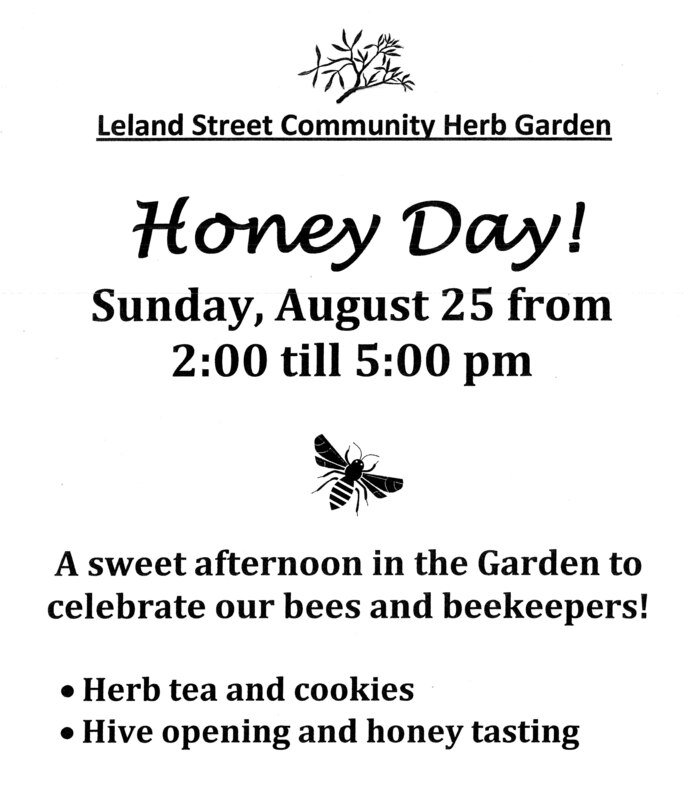 The Leland apiarists, Sadie Richards and Addy Smith-Rieman, will begin the day by talking briefly about their beekeeping philosophy, opening a hive for curious onlookers (veils will be available), and sampling various local honeys. Local beekeepers Stephanie Elson and Emile Bruneau of The Benevolent Bee will be selling their beehive products. 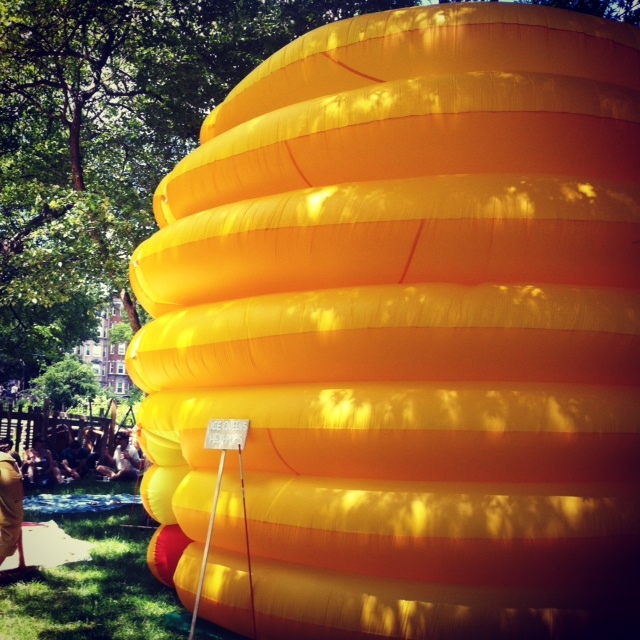 Artists and bee tenders Maria Molteni and Colette Aliman will be on site Festooning with their giant inflatable hive. The Leland Street Community Herb Garden is short uphill walk from the Orange Line Forest Hills T-stop. Walk via Weld Hill to Wachusett St. then a left on Leland! National Honey Bee Day this Saturday! Hello everyone! This is Sadie, taking a stab at my first blog post! 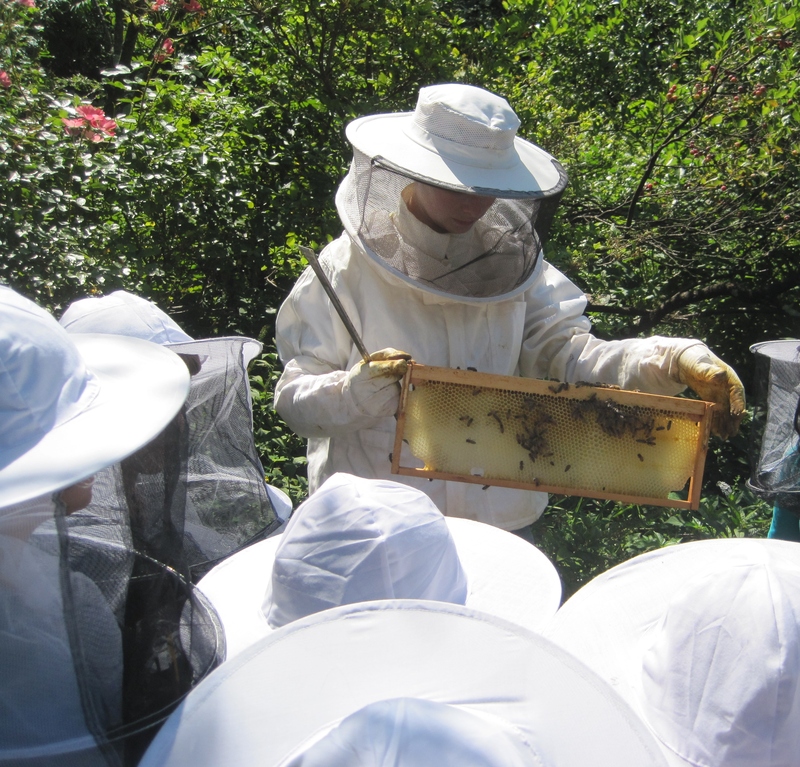 On Monday I had the joyful experience of exploring the social insect world and conquering fears in the apiary when I introduced 20 “Farm to Table” campers (9-12 year-olds from around Boston) to my two honeybee colonies at Leland – Linden and Locust. I was so inspired by this group of young people who will be the next generation of environmental stewards, and was reminded of one of the key reasons I keep bees – to educate and engage people (especially children) in ecological exploration and the interconnectedness of all life on earth. 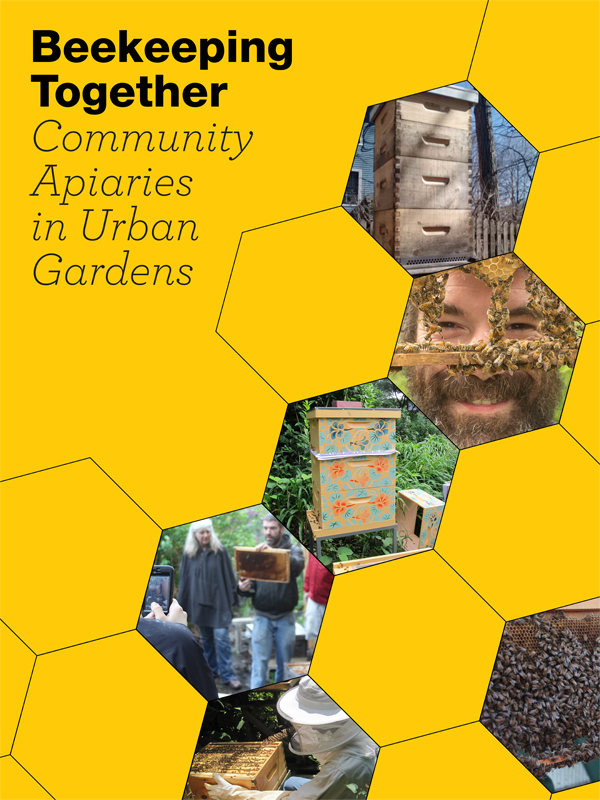 In that vein of thought, Addy, Kathleen (one of Leland garden’s co-founders who has tended the garden since it was created on neglected vacant land in 1983) and I will be speaking about our experiences and philosophy of beekeeping in a communal garden on National Honey Bee Day this Saturday, August 17th at 5:00pm at Follow The Honey, Inc. Come join us – and other wonderful tenders and lovers of bees – for an hour or the whole day! See below for the schedule and link to the event’s facebook page. Hosted by Follow The Honey, Inc.
Join us on the Nectar Deck for a day of fun, free & informal talks by the following fabulous honey bee mavens! Through the afternoon Melissa Brodeur of Bee Well Massage will be on site with mini-chair massages. Proceeds to bee research! Ouch, ouch and ouch… No matter how glorious the morning was, or how much honey I have in my hives, how happy the ladies are, or even how excited I was that some friends showed up at the garden to learn more about Mavis and Sally – nothing takes away the pain of the sting… especially on my high cheekbone! I’m writing this with half a swollen face – barely able to see out of my right eye – (I thought it best to not share a visual) – and frustrated that I did not listen to my gut instinct to NOT take off my veil… But I was hot, and in the midst of great conversation – and well… I made a huge mistake! Lesson learned! 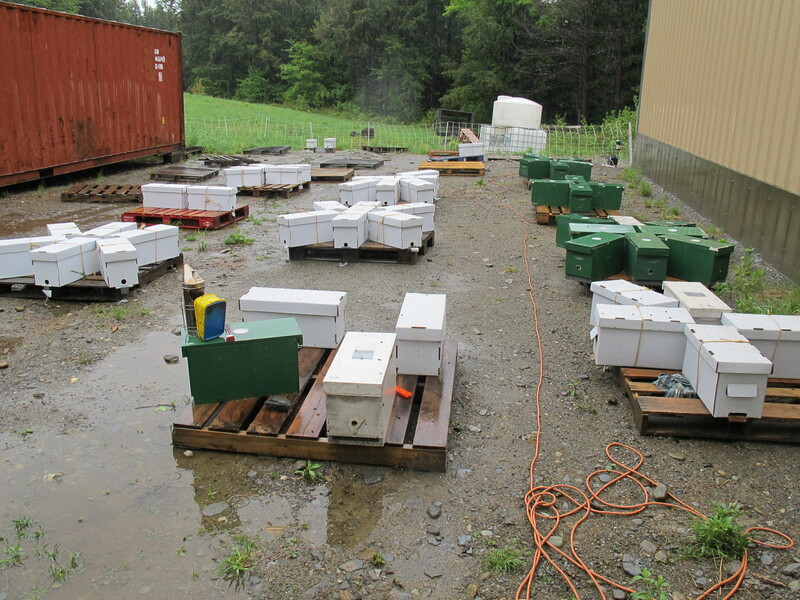 But the foolery took place after a full inspection of both hives- and wow! Both Sally and Mavis are producing brood and honey unlike anything I have ever seen. There are FULL frames of honey on the outer edges of the deep hive bodies and the supers I installed a few weeks ago are well on their way to being full with uncapped honey. The brood in the frames looks extremely healthy and has a diverse mix of eggs and larvae at various stages. Most hives have mites – so I‘ll have to pay close attention to the strength of Sally and make sure the ladies can keep this pest in check. I’m against treating chemically – so the only treatment I even consider is powdered sugar – where you douse the frames, covering the bees in a snow-like haze. 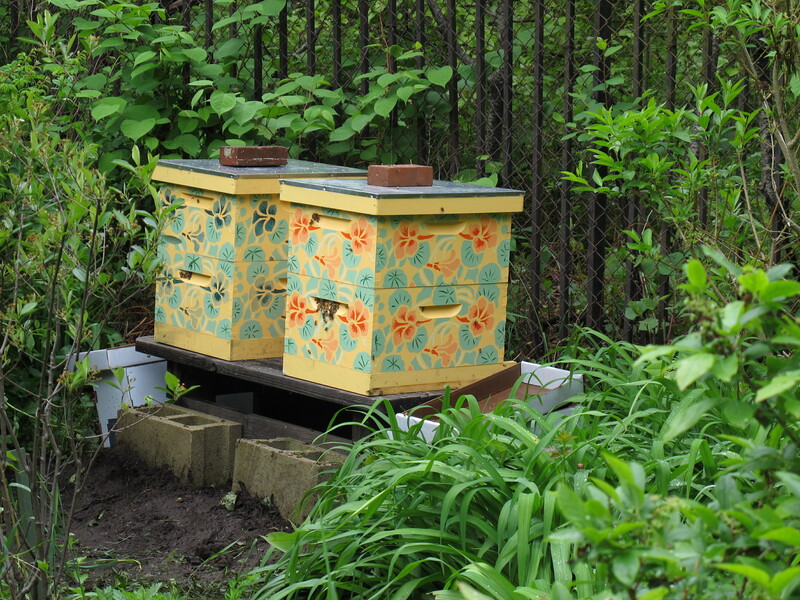 I did this last year with great results (I had a mite free hive) – but it really angers the bees and causes unnecessary sugar build-up along the frames (and what they don’t clean up can/will turn to mold). So this year I’m letting the bees fend for themselves… We’ll see! With only one extra veil to share among the onlookers, each took turns venturing over to the hive with caution and curiosity – Stephanie was first and fared well –but it was Charlotte, the next onlooker, who took the first sting (under her arm!) – sorry Charlotte! And then poor Heather – she was keeping her distance – standing far back in the garden with Josh when a honey bee flew in to her nose – IN TO her nose – but she remained beautifully calm, kept talking and then in one strong blow expelled the bee from her nostril – safely – and both she and the bee were spared! BUT – later, when she came closer to the hive to take one last peak, another bee landed on the tip of her nose and well… she wasn’t so lucky this time! Oh, gosh, two friends stung on my invitation – I felt so horrible. But bees do sting! And it makes me realize I’m at fault for not warning my guests enough on the great agitators. Sweat (and it was brutally hot – and we were all dripping with it) really ticks the ladies off, so does any residue of banana (banana mimics enemy pheromones). I learned that Charlotte had a banana earlier in the day – yikes! Tank tops, shorts and sandals aren’t the best attire – I wear a long sleeved shirt under a canvas jacket with heavy canvas pants and boots – probably a bit excessive – but I am going deep in to the hive. Sadie has extra veils (I only have one extra) so in the future I’ll pick more up on the way to the garden so no one will have to wait to trade off. 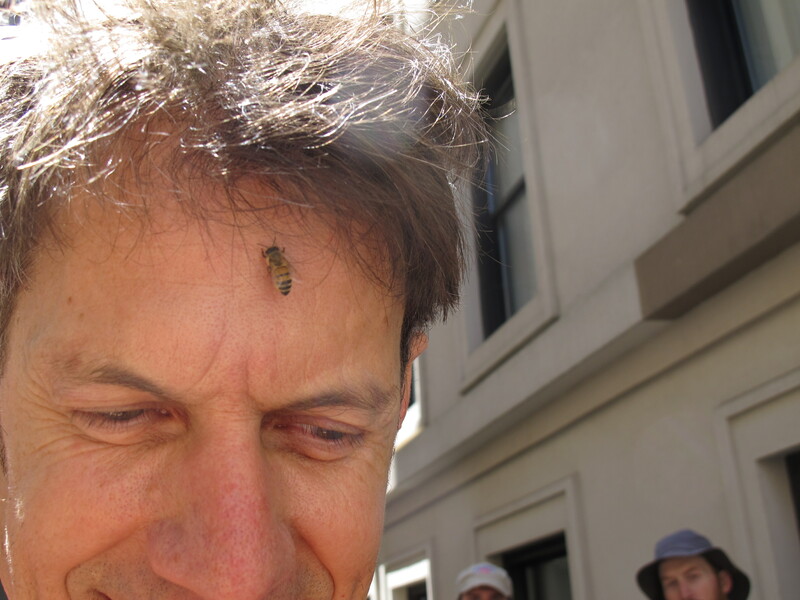 But bring a light jacket at the very least – as for bees flying up someone’s nose… I’m at a loss on preventing that! My next visit will be in two weeks – when I will check on these super towers! I hope I haven’t scared anyone away with the tales of the day – it can be used as a cautionary tale – when visiting the hives PLEASE do not eat any bananas prior! But it’s still a ton of fun – and always filled with amazing discoveries. I hope to see some of you in the garden! I can’t believe it has been FIVE months since I last posted to bee-mail! Gosh I have been busy as a bee! 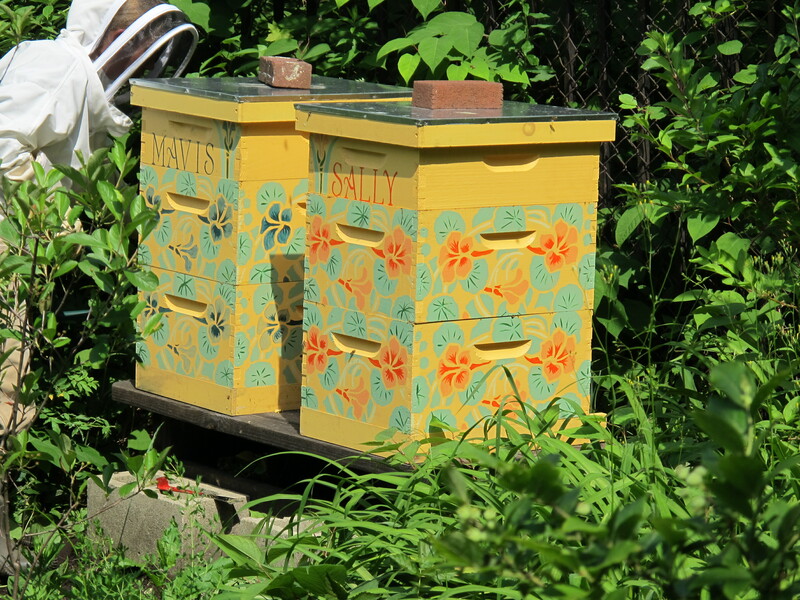 But what a winter/spring chock-a-block with bee related events! 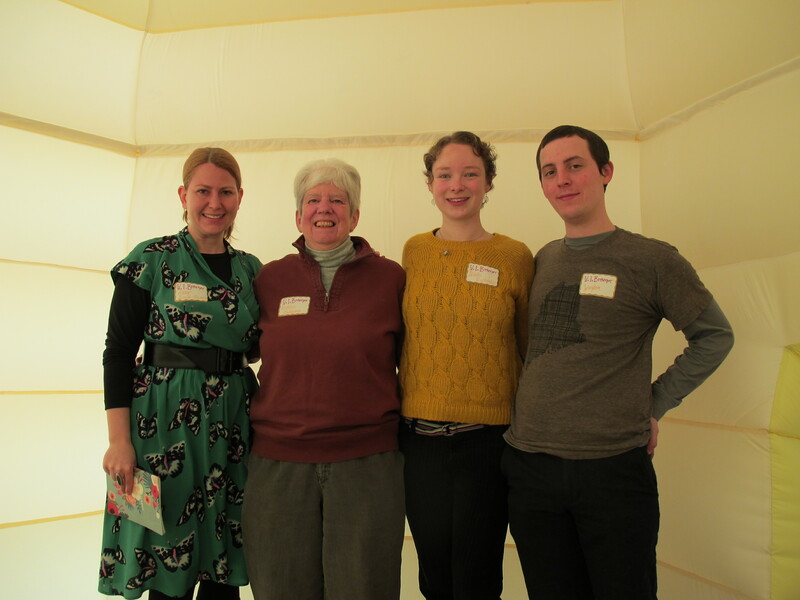 First – there was the February Festooning extravaganza let by Maria Molteni and Colette Aliman at the BU 808 Gallery. Wow! What an honor to be a part of this group! Sadie and I, along with Kathleen Robinson, were there to present on the Leland Garden and its history of apiary stewardship – it’s always a treat to hear Kathleen tell the tale of the founding of the garden! 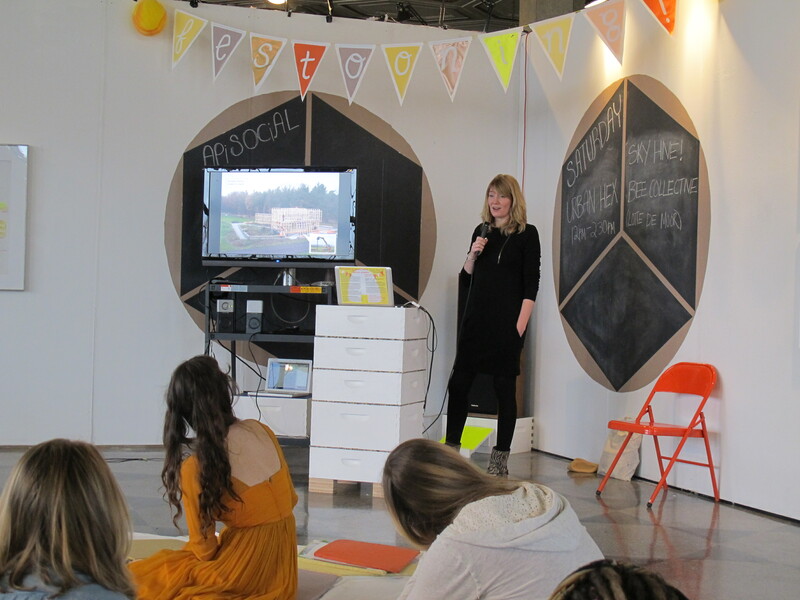 My favorite presenter from this event was Lotte de Moor from SkyHive – not only was she a blast to hang out with after the day’s events – but I really love what this design collective does. The February Festooning was followed by the March BNAN (Boston Natural Areas Network) Gardener’s Gathering – where my friend Mario D’Amato, a newly minted MUG (Master Urban Gardener) 2013 graduate and beekeeper at the Victory Gardens, facilitated a panel on urban beekeeping. 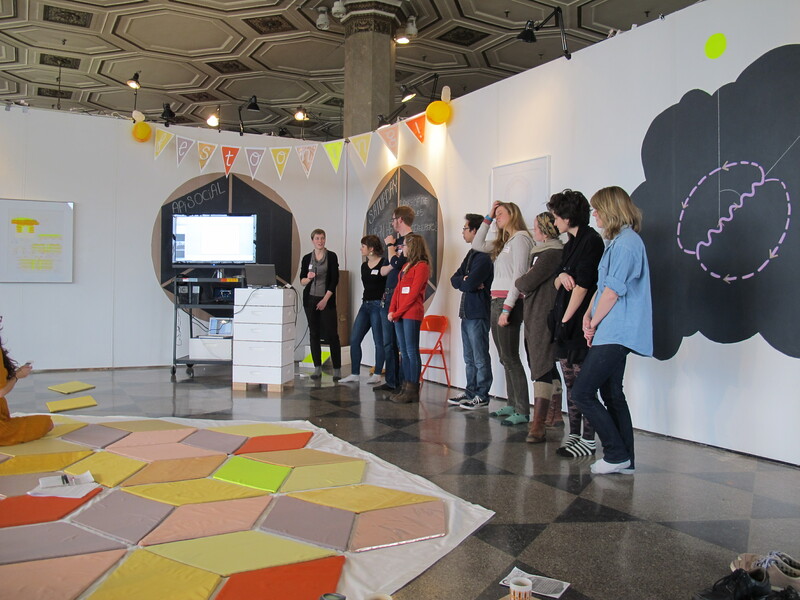 Sadie and I, along with Bill Perkins from Ag Hall and Dean and Ramona from Golden Rule, shared our apis mellifora tales with a rapt audience: curious, engaged and ready to embark on their own adventure. Two apiaries got back to me – Nature’s Way Farms in the Finger Lakes region of New York (a region dear to my heart because of grad school) – and the other, Northwoods Apiary in Westfield, the far reaches of Northern Vermont on the Canadian border (also dear to me as I lived in the Northeast Kingdom for over 5 years). Josh carries hygienic Carniolan Queens – winter hardy ladies of Slovak/Czech Carpathian Mountain region descent – that are open mated with Vermont (or Canadian) drones – wow – that’s an awesome pedigree! I was pleased with my selection – but had to wait until Memorial Day to pick them up. What a great excuse to plan a weekend in Vermont – visiting friends en route to pick up bees from the same town, Westfield, my favorite cheese comes from. It was a glorious weekend (except for the weather) – with one night in Hardwick, a day in Glover and one night in the Eastern Townships of Quebec (in North Hatley). We had to drive a friend to Montpelier – so at one point there were three humans, two dogs and 40,000 bees in our little Honda Fit! Fun times – even if it SNOWED on the way home! Yes, snow on Memorial Day Weekend – such a typical late spring in northern New England. 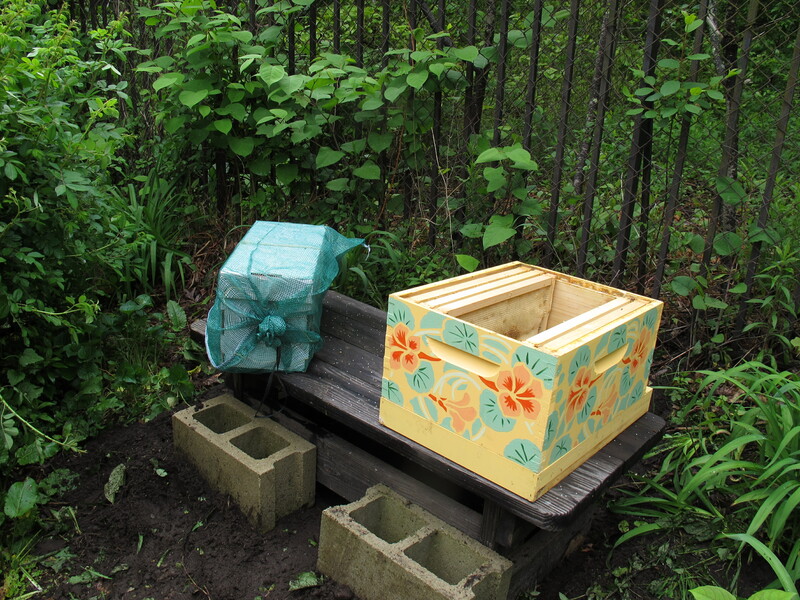 The bees were introduced to their new home – with some modification to the site in the garden. 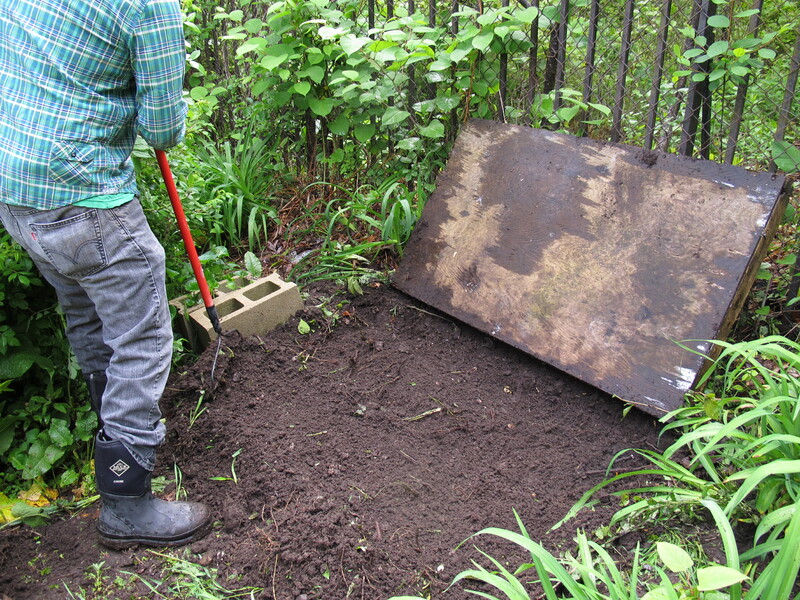 Josh and I weeded and leveled the soil and replaced my beautiful stands with the old table for sturdier support. And that was it! 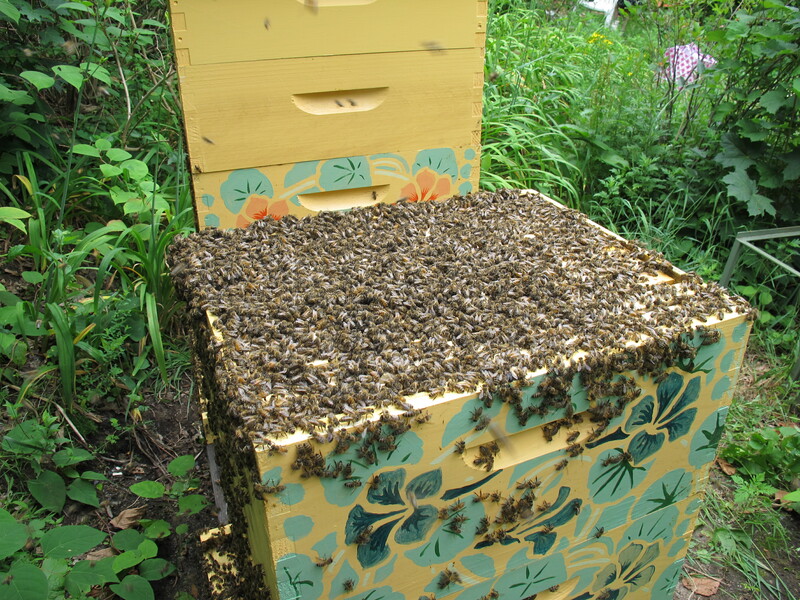 While the ladies adjusted to the ‘southern’ climate and new digs I continued my bee endeavors at the 3rd Tour de Hives. 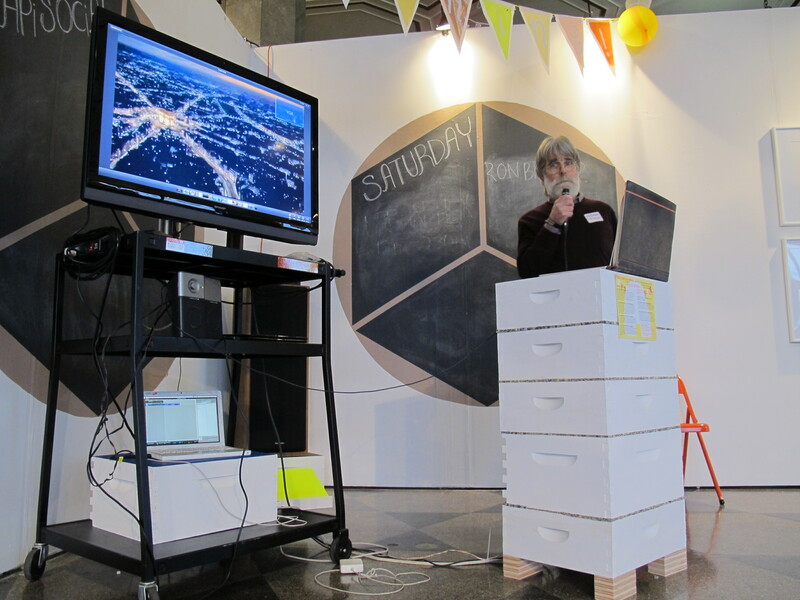 What an amazing event – produced by incredible volunteers from the Boston Beekeepers Club to introduce urban beekeeping and urban cycling to those in the Boston metro area. Bikes and bees – what’s not to LOVE?!? The number of people in attendance (I’m guessing 150 – could have been more!) and their curiosity and enthusiasm was so exciting! Mark your calendar for next year – this is truly an event NOT TO MISS! I visited my ladies one time since the installation – for a very quick inspection two weeks ago (6/23) – and gosh were they active – they’re working hard! With almost two deeps totally full I added on a super to each hive. I plan to add another super this weekend. 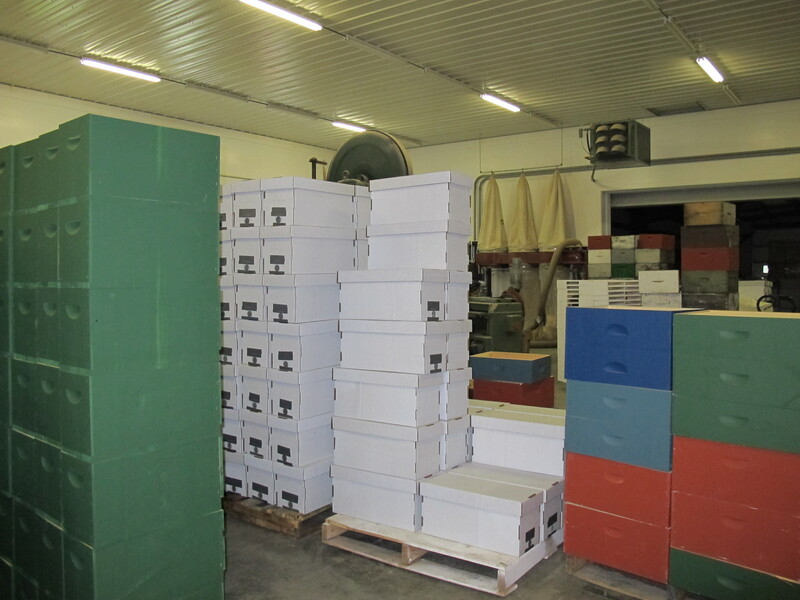 And I’m back in the bee-Mail groove – so stay tuned for a post after the inspection – I’m sure there will be tons to share!